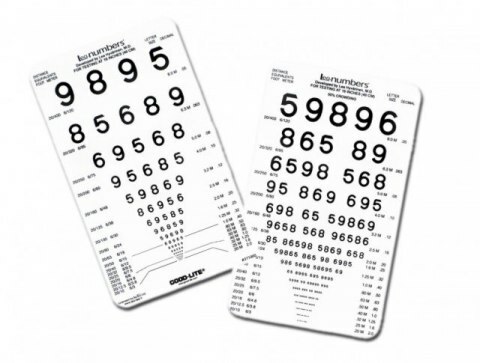 This test is designed for testing patients’ visual acuity during rounds and in similar situations with a need for quick testing. The test has proportionally spaced (logMAR) lines on one side and tightly crowded lines (50% spacing) on the reverse side Line sizes from 20/400 to 20/10 (6/120 to 6/3) equivalent, 0.05 to 2.00. 3.75" x 6.25" (9.5 cm x 15.9 cm).